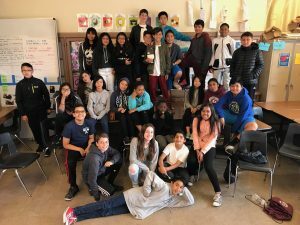 Through the generous financial support of parents, grandparents, alumni and friends, the PTSA supports Denman in fulfilling its mission to provide each student with an equal opportunity to succeed. Please explore the various opportunities and contribute to the School in a way that is meaningful for your family. Please consider a contribution to the Denman Annual Fund, our direct giving campaign. It’s the most immediate way to financially contribute to our school. Middle school is just 3 short years. Please donate now, so your student(s) will benefit in the 2018-19 year from your generosity. If you donate by check, mention “Denman Pride Fund” in the memo. Your Denman Pride Fund donation can go twice as far! Your contribution may be matched by your employer. Please contact your Human Resources administrator for details on how your company can join you in supporting James Denman Middle School. Ensure matching fund donation is made payable to “James Denman PTSA,” which is an IRS 501 (c)(3) charitable organization (Federal tax ID # 90-0914298). Become a Basementeer! Mention DENMAN MS at checkout: get 10% off and earn 10% for our school!